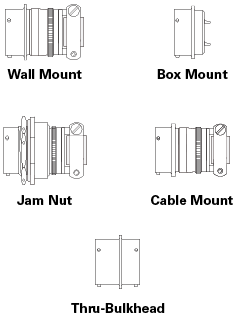 There are four common receptacle shell styles: wall mount, box mount, cable mount, and jam nut. Some Milnec’s series also offer a specialized thru-bulkhead receptacle for applications that require a feed-through on bulkheads or panels. The HM Series also offers hermetic receptacles for vacuum applications or the ultimate in environmental protection. This variety of shell styles offers engineers a number of options when designing a connector solution. Each shell style provides a different design feature that can make it better suited than others for certain applications. It is up to the engineer to decide which shell style works best for the job. Learn more about shell styles. For our example, let’s select a wall mount receptacle. As you will see when building a part through our online part builder or when using our catalog, as you build a connector you also build a part number in which each modifier represents a particular configuration. So far, our part number is PS 00 F 18-9. PS is the Milnec connector series. 00 represents the shell style we have selected, in this case a wall mount receptacle. F is the finish on the shell. F is our standard olive drab cadmium finish. Finally, 18-9 is the insert we selected.